!Setup a split tunnel access-list in order to define traffic that will be routed over from the client side. 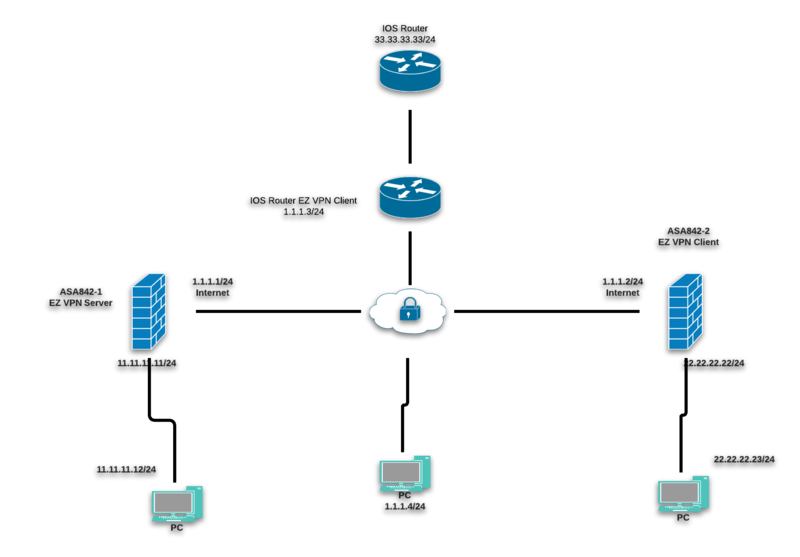 This access-list will be pushed out to the client upon establishment of the VPN tunnel. !setup your Phase 2 parameters and apply it to the interface. !setup the PHASE 1 encryption parameters. !Next you will need to define a group policy for the client. All these settings will be pushed out to the client upon connectivity to the VPN. Make note of the NEM enable option on the last line, as this will enable the Network Extension mode option. Also, you will need the password-storage enable option to allow the client username to be stored on the device. Otherwise you will be prompted to enter the username and password each time you establish the tunnel. !Create a username that you will be using on the client to connect to the server. Like the software VPN, this is the user credentials supplied for additional authentication. !Apply the group policy settings in a tunnel-group. This is where you enter the preshared key for your phase 1 authentication. !--- appropriate Easy VPN group on the Easy VPN server. !--- in order to complete the Easy VPN. !--- and can be accessed via Easy VPN. 3.1. The vpnclient command (Easy VPN client) only works on 5505 model; since ASA VM emulates a 5520 or generic F1, that feature isn't available. 3.2. 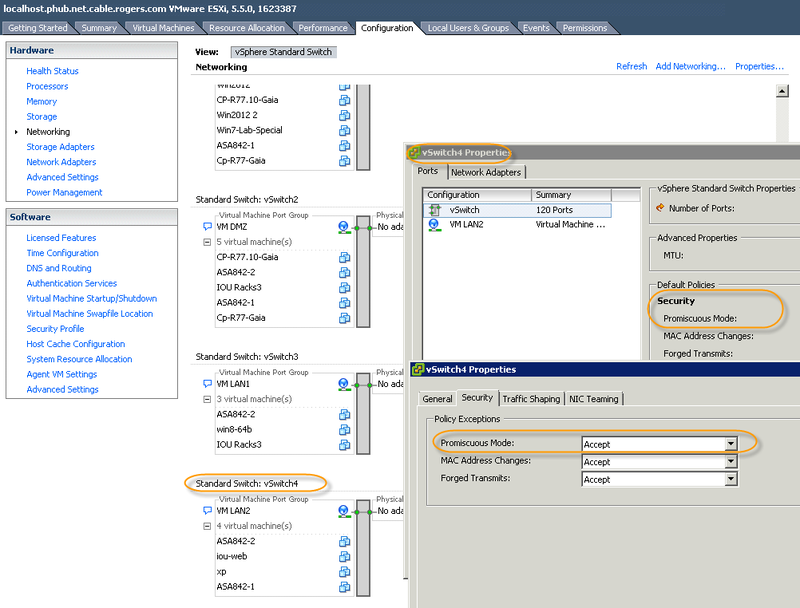 ESXi vSwitch Configuration. Promiscuous mode was used in my ESXi ASA vm network card to communicate with other VMs. 3.3. Enable Communication between Remote Sites. This command will make traffic between spokes working.